Darkest Dungeon: The Crimson Court expansion is getting some tweaking, and it's also got an official release date for those playing on PSN. 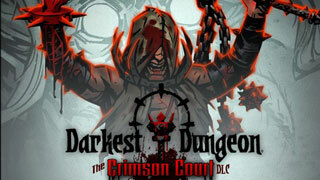 Darkest Dungeon's first expansion, titled The Crimson Court, has been out for about two weeks now, and Red Hook Studios says that it has already sold over 175,000 copies. Of course, the developer is also tweaking the formula a bit now that the game is in the wild. In a post on the game's official site, the developer explained some of the changes that it is making to the expansions. They include making sure the initial Courtyard quest is clearly marked as "not suitable for fresh recruits, and is longer that a usual no-firewood short quest." Red Hook says it wanted to let players check out the new content as soon as possible, but that unfortunately many felt tricked into taking "underpowered heroes into a rough dungeon." There's also a fix for the lack of the blood needed to calm heroes with the Crimson Curse. The drop rate for blood has been tuned "several times," and Red Hook says it will be "adding a 'Gather the Blood' courtyard quest, which requires no Invitation, and will become a reliable, primary source of blood." Of course, there's a counter, and it's that random drops of blood will be less frequent. The quest will make blood collection more reliable when it goes live later this week. One other change worth mentioning: The Fanatic will now drop a new tonic, "The Cure," that will remove the Crimson Curse from one hero. He'll also drop better loot in future encounters. You can find all the changes described in full over in the blog post linked above. Also in that blog post, Red Hook announces that it will be bringing The Crimson Court DLC to PS4 and PS Vita players on August 22. The developer says, "This is a bit later than we originally intended, but it will result in the most stable and smooth release, which is ultimately the most important factor." Finally, there's a tease of Darkest Dungeon coming to other platforms, as well. Red Hook says, "Many of you have been asking about Switch, Xbox, tablet, and such. The short answer is that yes, other platforms are planned for release. We can't formally announce anything just yet, but news is not far away and we can't wait to share with you!" We'll keep an eye out for more news on this when it becomes available. Need some help surviving The Crimson Court? Check out our guides!